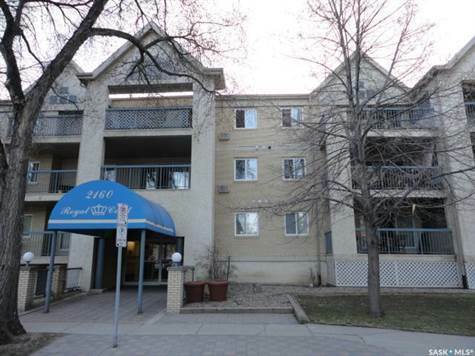 #104 2160 Cornwall Street Transition Area/Downtown MLS#SK764521. Excellent location for this 1087 sq. ft. Open Concept 2 bedroom, 2 bathroom condo which is just a short walk to all downtown amenities. Modern renovated kitchen with quartz island countertop, new modern light fixture, lots of counter space, large pantry, fridge, stove, b/I dishwasher and hood fan. Kitchen is open to spacious diningroom with large newer window and livingroom with patio doors to spacious deck facing east. There are 2 very spacious bedrooms, master features 2 pc ensuite and walk-in closet. There is insuite laundry and a very spacious 4 pc bathroom that complete the unit. There is underground parking, storage unit, amenities/game room. Condo fees $394.00 include heat, water, common area maintenance, garbage removal, building insurance and reserve fund. This building also has an elevator. Sorry NO pets. Quick possession available.